ChipsAway, the UK’s leading ‘on-the-spot’ automotive paintwork repair specialist, has been shortlisted for a prestigious Franchise Marketing Award in the ‘Best Online Marketing Campaign’ category. 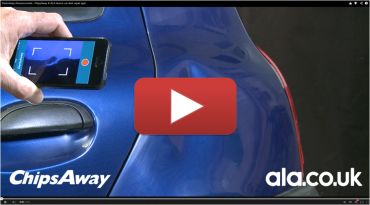 The chosen entry focused on a viral campaign produced for April Fool’s day, which shows the launch, by ChipsAway, of ‘DentsAway’ – a new Smartphone app, which could fix dents in your car with just the touch of a button! The campaign proved a huge success and substantially outperformed initial expectations; increasing engagement with consumers via social media channels with 65,000+ views and generating some fantastic industry press coverage online via sites such as MSN, AutoExpress and Cars UK, not to mention helping to generate an impressive £43,000 worth of work for the network with an ROI of 2,326%! To date, the viral video has received an incredible 13,600+ views on YouTube, with some fantastic comments relating to how funny people thought it was. According to Lidia Benvie-Ferreiros, Group Marketing Manager at ChipsAway, customer-focused marketing is a high priority for the company, and is paying dividends for franchisees and customers alike.